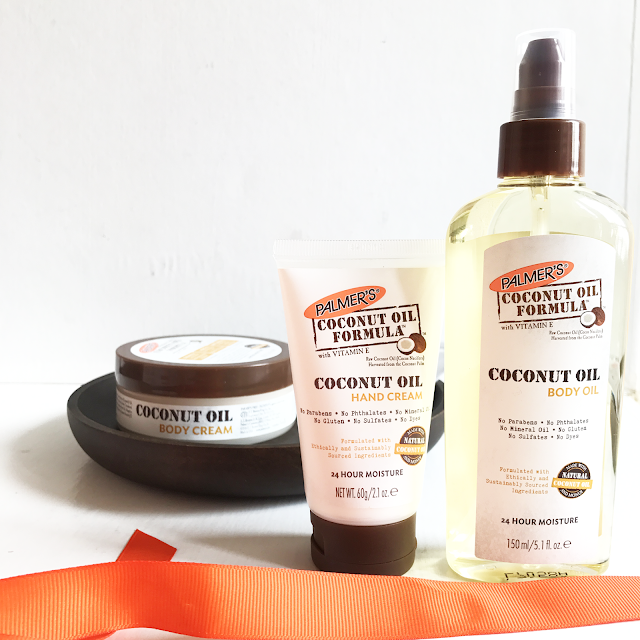 Palmer's is a brand that has been a family favourite for such a long time so I have been so excited to trial a few products from their coconut oil formula range. My family is absolutely obsessed with coconut oil its just amazing for everything we cook with it we use it on our hair and on our skin, its mainly due to my husbands influence which I am so grateful after I've seen the natural benefits over time. On the topic of my husband when he saw the Palmer's bag he seemed even more excited than I was and he doesn't get excited over anything I get sent haha. So Palmers Coconut Oil Formula contains no phosphates, no phthalates,no mineral oil, no gluten, no sulphates and no dyes. The range also contains ethically and sustainably sourced coconut oil and tahitian monoi oil, infused with tiare flower petals. So today I will be talking about some of their products that are for the body and some that are for the hair. Coconut Oil Leave-in Conditioner- This is one of the first products I used straight away as soon as I opened the bag and we've been inseparable ever since. I've sprayed my hair with it and put it in a couple of braids and its really left it moistured and smelling like the spray for a few days. I have extremely dry and curly hair so leave-in conditioners are life. Later on I used as instructed on damp hair and combed through my hair and its really helped to reduce tangles and my frizz which I am happy about. Whenever my hair needs a quick boost I just spray it with this for healthier looking hair. 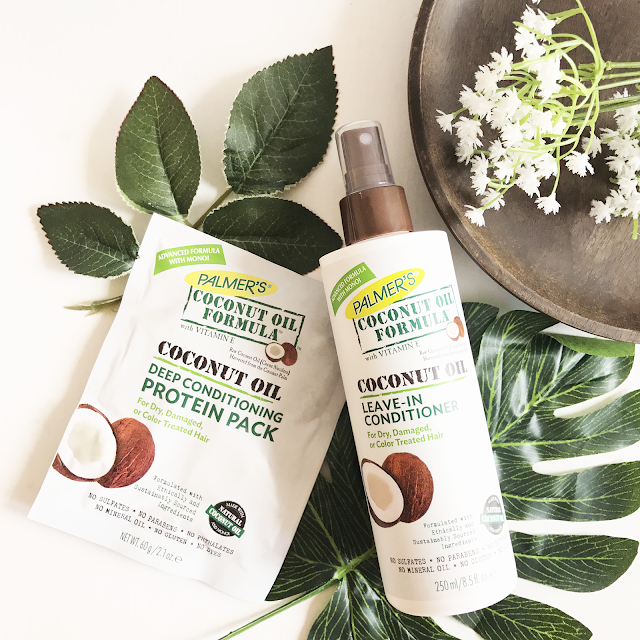 The Coconut Oil Deep Conditioning Protein Pack- This pack comes with us such a generous amount and the smell just fills my bathroom if you love the smell of coconuts this will be a real treat for you. The creamy texture really coats and detangles the hair my only thing is that if you don't like washing your hair for long periods coat your hair with less of the product. At first I didn't think it did a whole lot but I've noticed my hair breaks less during washing and styling and breakage has always been an issue for me. So I just went out and purchased a second pack of the stuff. All of the products that were sent to me promote 24 hours moisture. On the topic of the Coconut Oil Body Cream I apply that on my arms, legs and my general body its so moisturising "the stuff is life" and my skin still feels great at the end of the day, I really want to put this to the test in winter because I tend to have dry skin. The Coconut Oil Lip Balm is just amazing I have really dry chapped lips especially during the winter and I know this is going to have a permanent spot in my handbag. It promises to protect lips against chapping, cracking and environmental damage from the sun and winter. Another product that is a definite handbag essential is the Coconut Oil Hand Cream I've only had to use this once on my hands at the beginning of the day and my hands remained moisturised and it wasn't overly greasy. It promises to envelope hands in a glove like protective barrier that locks in moisture and soften skin texture. It also contains sweet almond oil which I absolutely love. I love love love all the bodycare stuff ALOT so I have a suspicion that the skincare products for the face will work quite well for me. My only niggle..because the packaging is the type of material it is you have to be careful with it because it can look very greasy very fast. But I love the packaging of the products in terms of the general look of them. The Protein Pack has become a staple in my haircare when it comes to deep conditioning to the effect I went out to get another one. So now where in the Autumn months I've definitely got my hair and skin covered in terms of moisture thanks to Palmer's. This entire range can be purchased at Superdrug as well as other stores. Have you tried palmers? 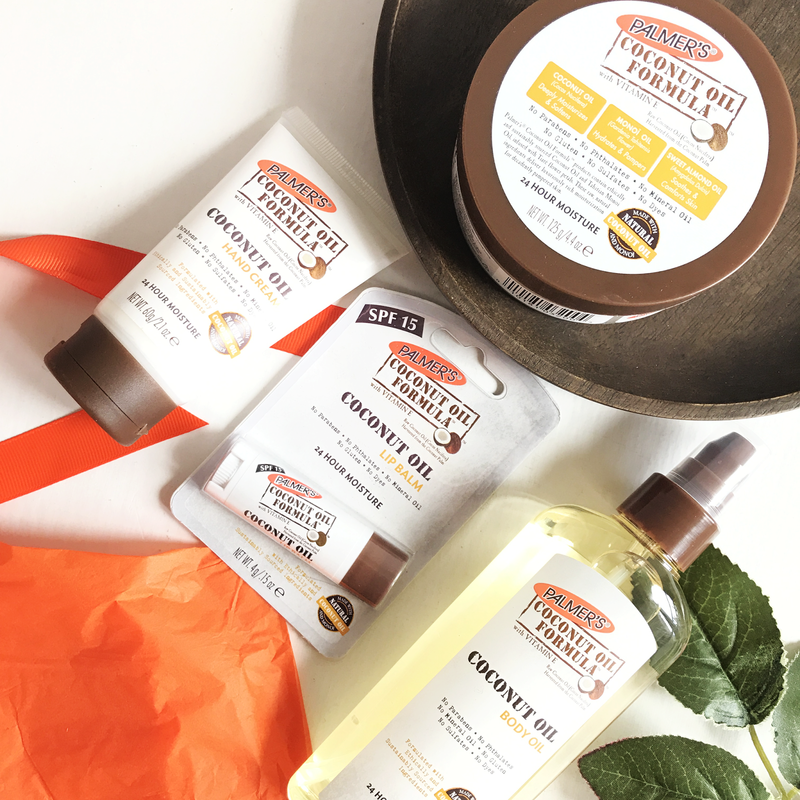 What are your favourite Palmer's products? I would love to try these products! I love using pure coconut oil as a hydrating mask in my hair before I wash but it can get messy. I would love to try some of these products out especially the protein pack!